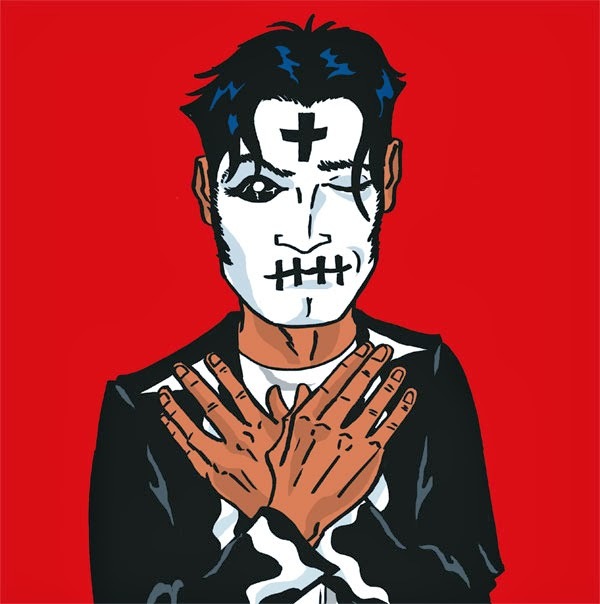 I've started a Tumblr for EL MUERTO. Or actually, re-started it! Back in August of 2013 I created it, but haven't posted since. So last night I got back on and added a few posts. I've even created some posts that'll be automatically uploaded in the next couple of days. Finding Felinus: Catching a character by the tail! 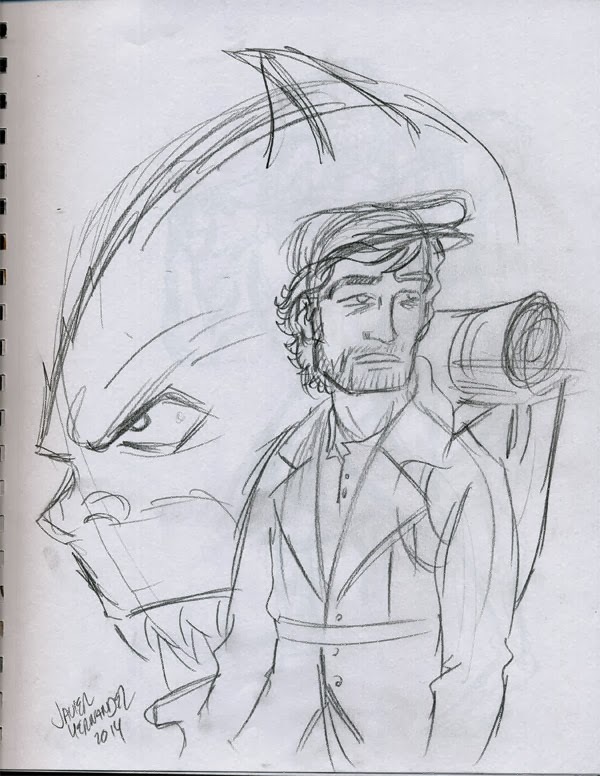 On January 13, I posted some drawings on my DeviantArt page. 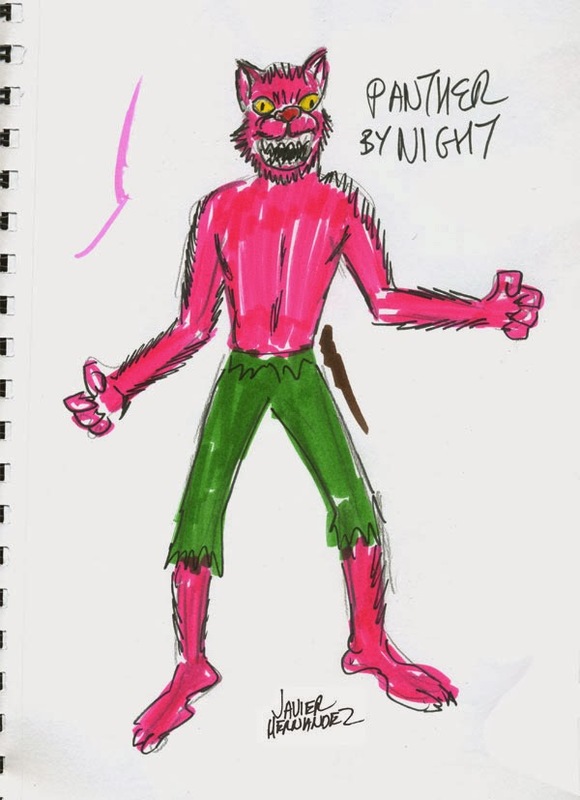 Two ideas I came up with on whim for some new sketch dolls, a Ronald McDonald parody and a mash-up of the Pink Panther and a werewolf. (I had produced some of these sketch dolls in the past, which are blank doll bodies that I draw on with fabric markers). After drawing that dual cannibal clown & panther sketch, I had a couple of laughs just looking at them. 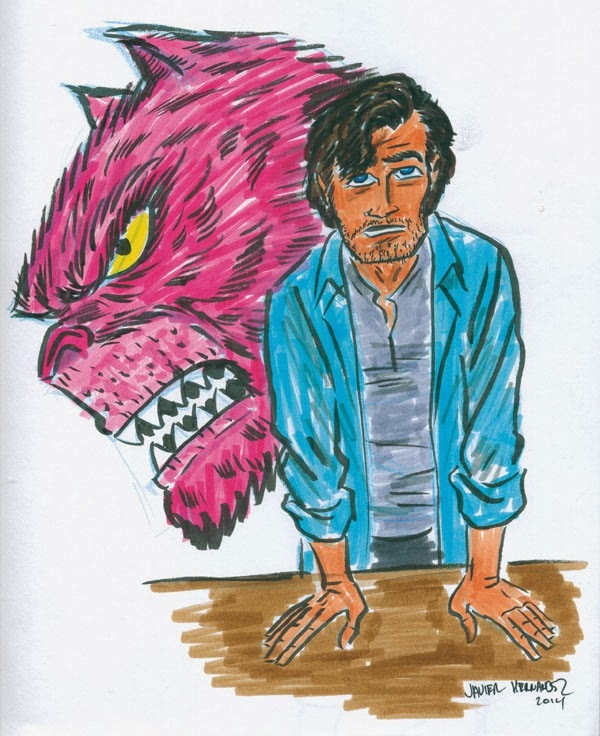 Then it occured to me that perhaps there was more life to my rose-colored wolfman than just as a sketch doll... So I redrew the character, this time thinking of more than just a design for a doll. 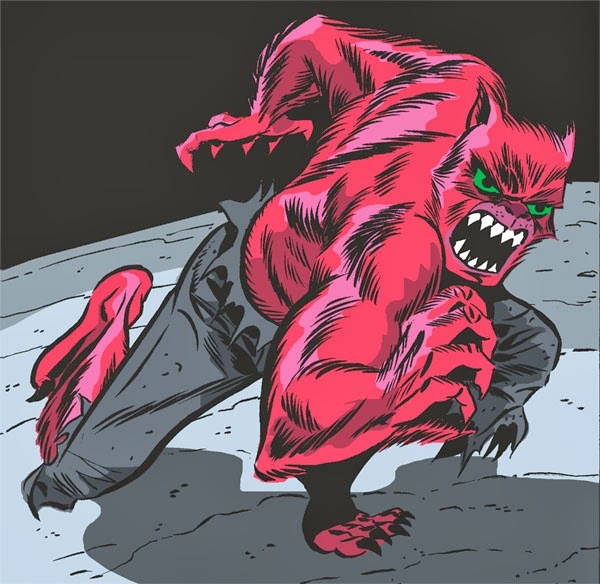 One of the things I did was change the color of his pants from green (which was what the Werewolf By Night wore) to grey. I was slowly pushing the character away from a straight 'homage', and also I felt that the grey worked really well against the warmness of the pink. Already I was thinking about exactly who and what this character was. 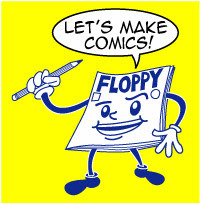 I came up with an origin story, and constructed it so it would fit the format of my Poster Comics, my one-page stories done in a much quicker process than a full-length comic would take. appealing color, one with a seductive, playful vibe. 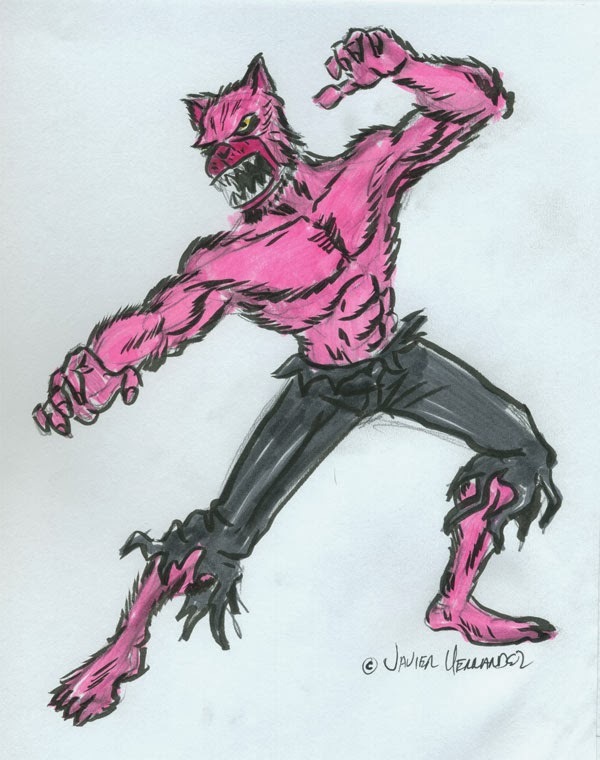 And the visual of a wild feral beast-man with pink fur had just the amount of outrageousness I was looking for in a new creation. 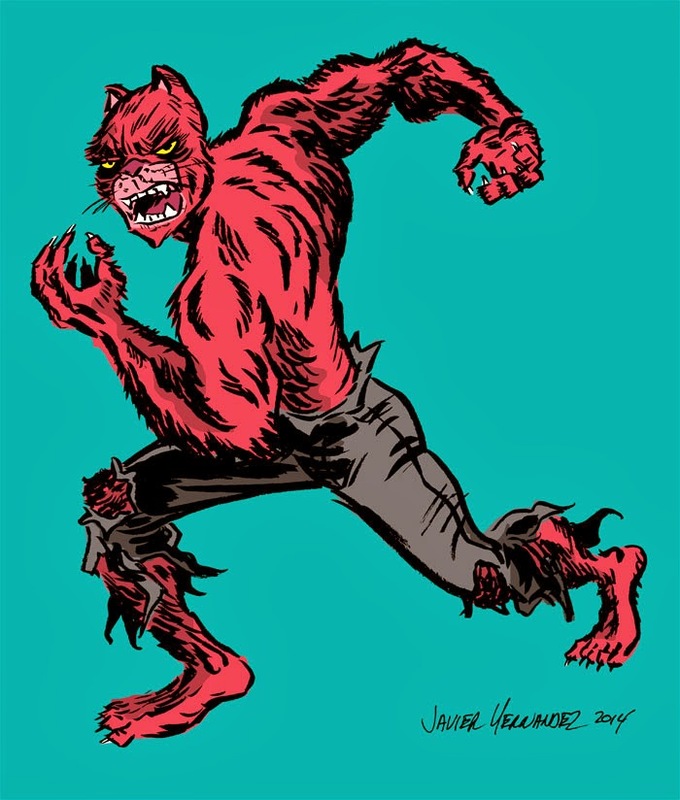 Besides the Panther, there's a handful of pink characters that came to mind: Hanna-Barbera's cartoon mountain lion Snagglepuss, Piglet from Winnie the Pooh and Frankenberry from the classic monster cereals. 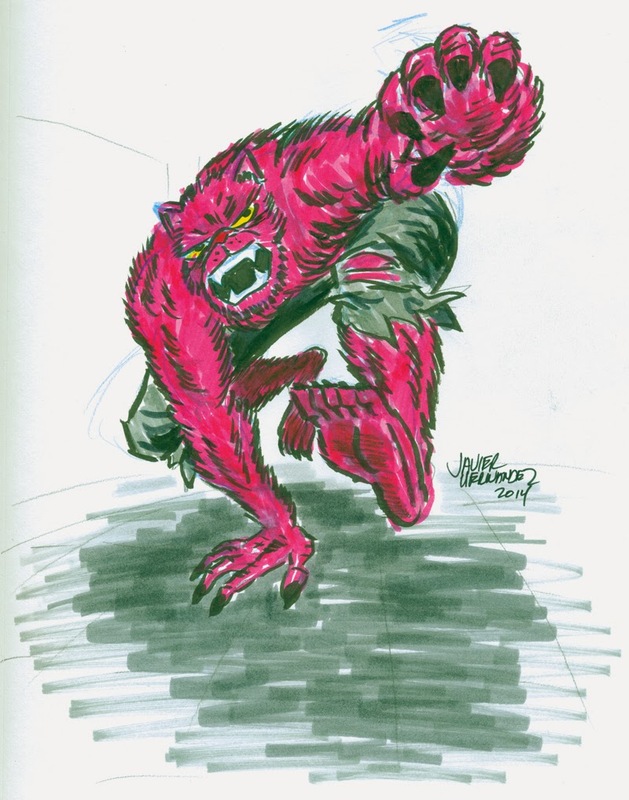 Why not add a fuchsia-colored lycanthrope to the mix? 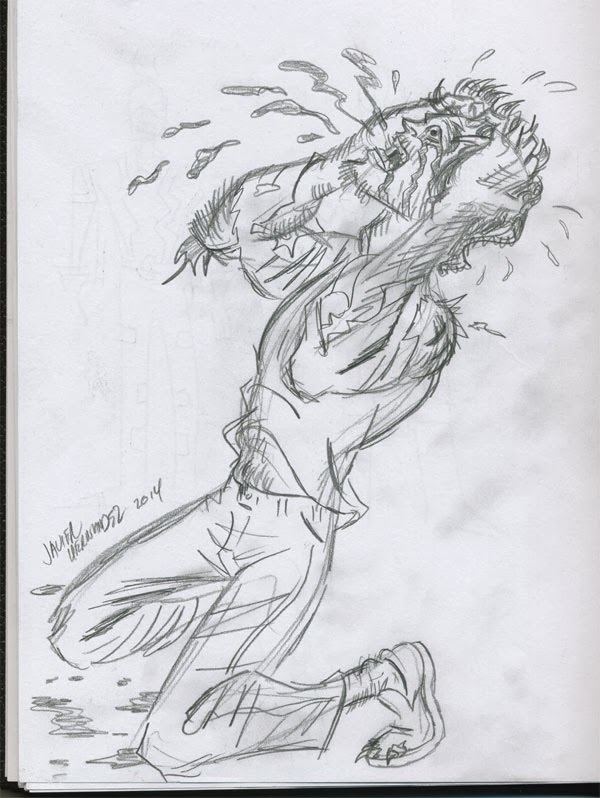 As I worked on this drawing it really hit me that the character was ripe for it's own life in a comic. 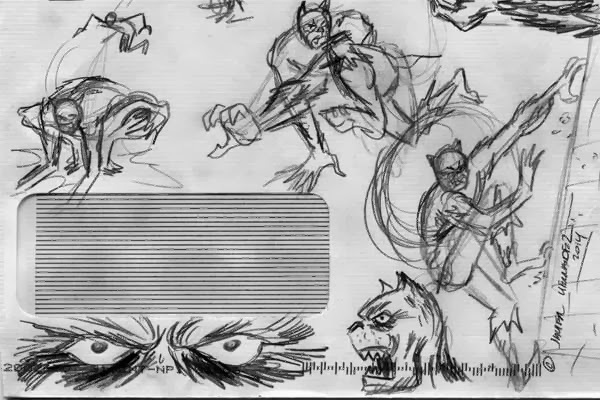 In the few short days since coming up with 'Panther by Night', my mind had spun around an origin story, and identity and alter ego for the man cat, a rouges gallery of monsters and madmen and supporting characters to further define the star. More studies followed, trying to figure out the character and how he moves, who he is. 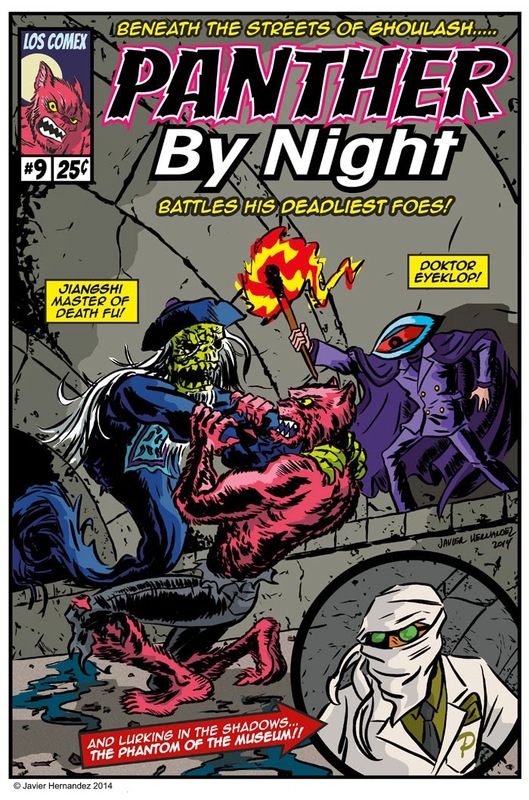 The more I fell in love with this idea, the more I began to question the original name I picked, "Panther by Night". 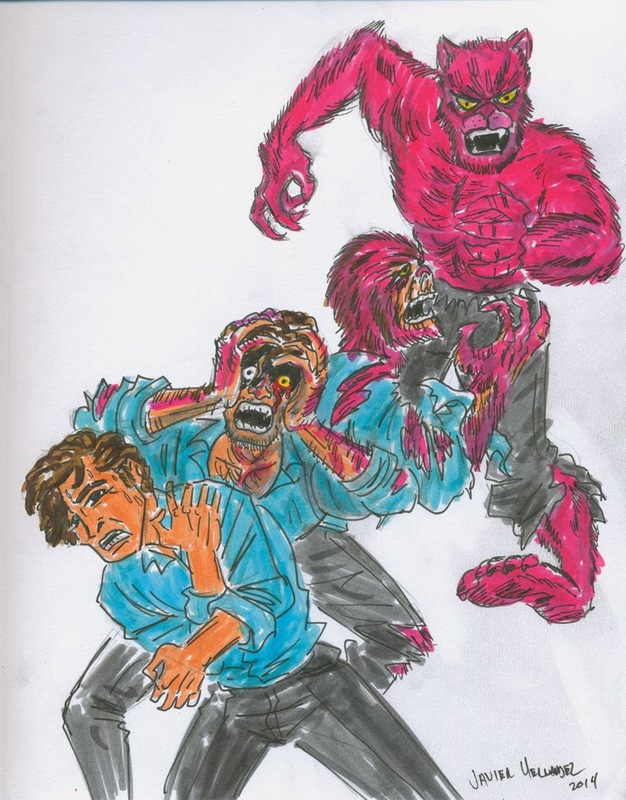 While the initial source for the concept came from an admiration and familiarity with the Pink Panther films (mixed in with the werewolf/superhero lore of the comic book), I wasn't trying to create a copy of that world. A friend of mine had even asked me if this was going to be a comedy, with the lead character taking clumsy pratfalls at every turn! I assured him that was never my intention, and shared with him some of my ideas for the story. There's a mythology to the Pink Panther series, even though it's a screwball comedy series. The Pink Panther diamond, it's cultural significance to the Middle Eastern country of Lugash (an invention of the screenplay), the Inspector, Kato, etc. 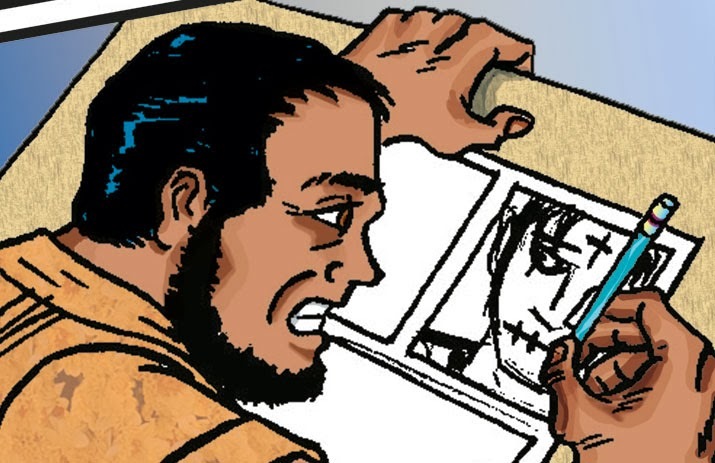 The stories and relationships of the various characters to one another are so familiar to me that by taking the entire mythology apart and using a few elements as starting points, I then infused it with monster movies, superhero comics, spy films and other things that catch my fancy, and built a whole new construct from it. One whose result is a wholly original idea for a completely new world, in an entirely different medium and genre. It's like looking at someone's elaborate Lego sculpture and using some of the same pieces they used in your own sculpture, even using some of those similar pieces in totally different ways. With that desire to establish the concept as it's own, after much trial and error, I christened my character Felinus. It can often be a challenge to find a name that hasn't been used before, but I often find that researching a name sometimes actually leads to other discoveries, which in turn further help you develop and enrich your original idea. 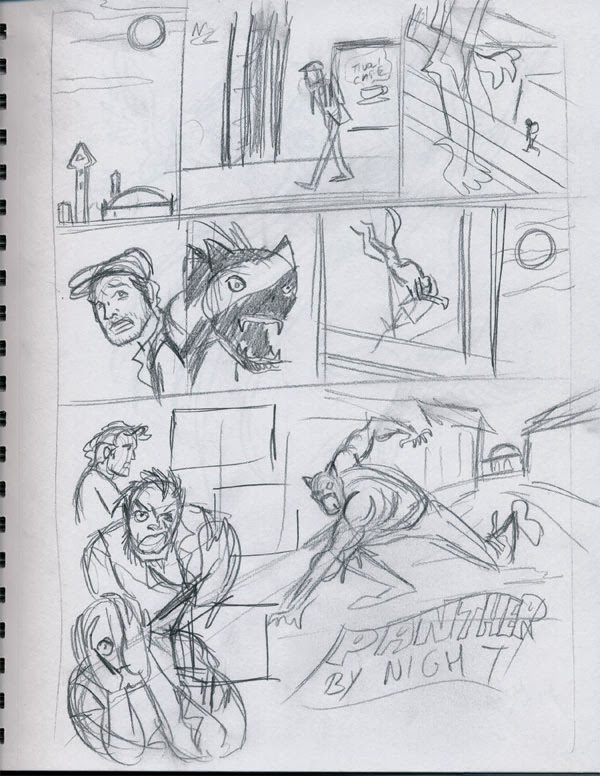 Within 2 weeks after I originally came up with the initial idea for the panther doll, I penciled the one page Poster Comic (on more or less Friday the 24). 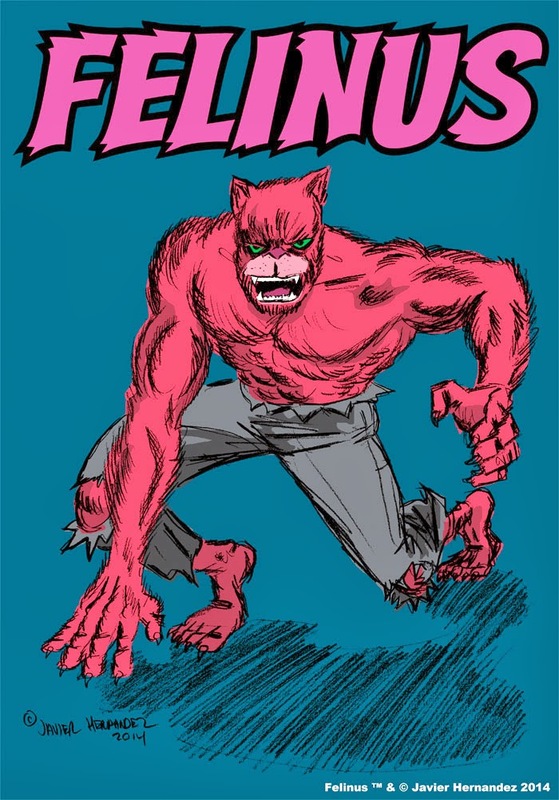 My friend (and fellow comics creator) Rafael Navarro had mentioned that he'd be more than willing to ink something featuring this character, so I asked, and he provided the inking on the Felinus Poster Comic. 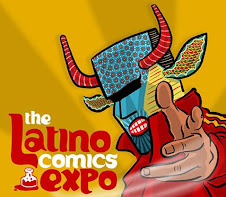 By Friday morning on January 31, the comic was posted online. You can see the results of our collaboration here. It always amazes me how you can come up with a little seed of an idea, then look at it from different angles and eventually spin a whole world out from it. That's how it worked for me with this Felinus concept. I kept seeing new connections between each new character, and creating new concepts out from previous ones. It's almost like the idea has always been there, but it took some outside influences to crack the ice and get things moving. I've already drafted up another story in which to further introduce Felinus, which I'll tackle before this month is over. 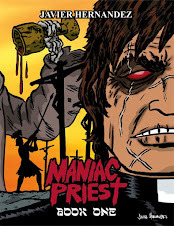 After that, it's a matter of scheduling time amongst my other commitments this year and produce a full length story. But the groundwork has been laid, the genie has been let out of the bottle. 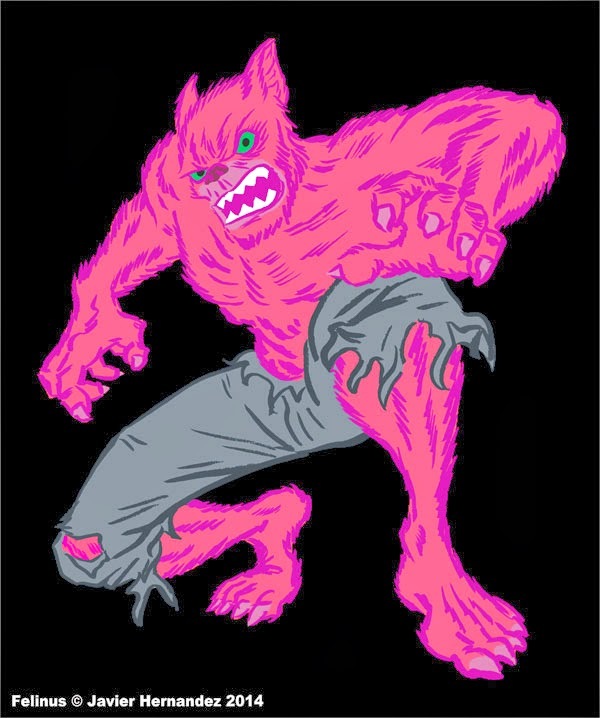 There's a magenta man-panther on the prowl! 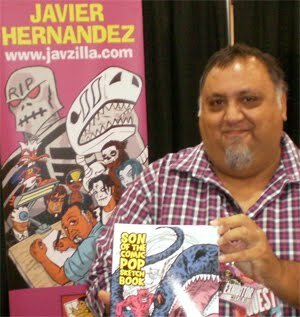 Felinus © & ™ Javier Hernandez 2014.